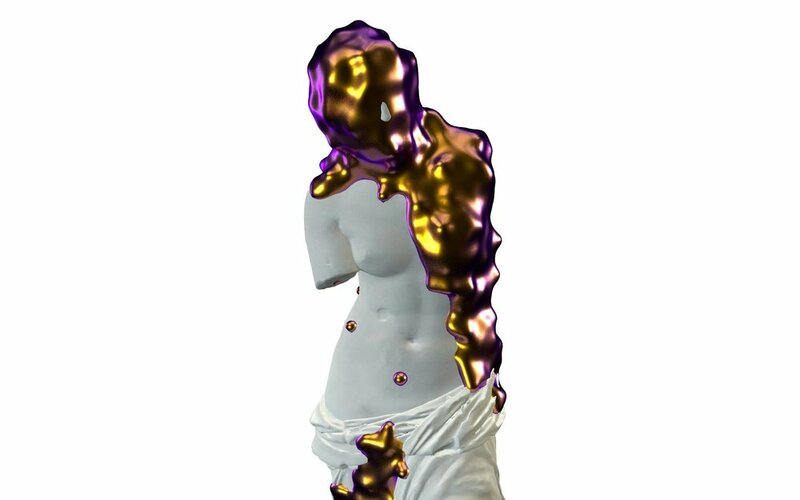 FACTS: A video of 3D scanned models from the Royal Cast Collection in Denmark. Audio track built around metadata played in left or right headphone, in order to create a spacial experience for the audience. KAS11KAS434/1 was a collaboration with the Swedish/Danish artist Oskar Jakobsen, created for SMK Fridays. SMK recently released 3D printed casts from the Royal Cast Collection in augmented reality and online. NULEINN and Oskar Jakobsen were invited to work with the models for SMK Fridays event in October. The video is a play on the material, transforming the models from mat white cast to a blank metallic coloured surface. We choose two casts depicting western idyllic body understanding, namely Venus de Milo and Doryphoros “The Speer Bearer”. The two are morphed together in a new bodily understanding.